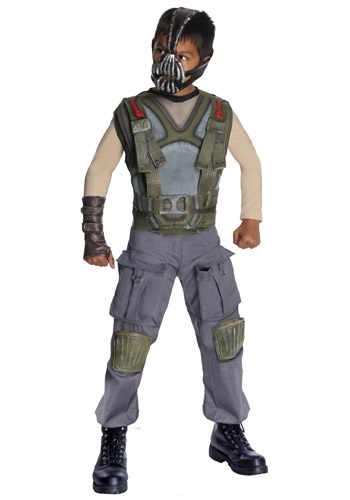 Even fans of the Gotham Rogues will be impressed by the detail on this Kids Deluxe Bane Costume. Hey, it’s never fun to have your favorite team’s season cut short by a masked madman and his reign of terror. But we think it’s a good idea to let bygones be bygones—especially when they result in a great-looking outfit like this! And we don’t think that anybody could be more stylish than the Dark Knight. But style isn’t that important when you’re powerful enough to shut down a whole city! That’s why official set comes with a rugged, action-ready jumpsuit featuring a molded chest piece, knee pads, and a plastic belt. With a latex version of Bane’s signature mask and a leathery-looking gauntlet, it’ll make anyone look tough enough to survive in the darkness of an underground prison! Though Bane might be seriously evil, he’s nothing if not hard-working. How else could he have gotten the strength to snap Batman in half like a toothpick? And who can deny that the villain’s chilling voice and calculating personality give him some of the best lines in the movie? You merely adopted the dark. I was born in it, molded by it! For a guy with just one name, he sure has a way with words! And someday, you and your child can analyze them to better understand the razor-thin line between the Caped Crusader and the lunatics he battles. But for now, just let your child enjoy their time behind the mask!